Inside: Looking for a non-book gift for the book-lover in your life? We’ve got you covered. The book-lover in your life is pretty easy to shop for – just get them a new book! 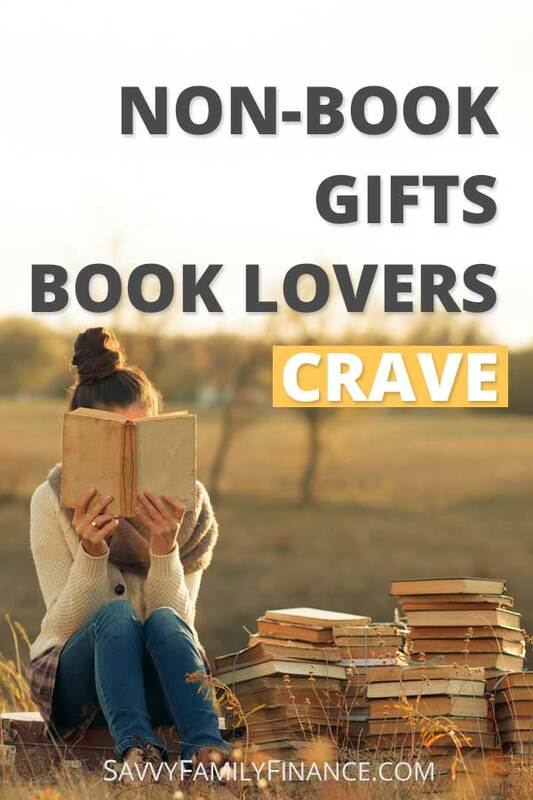 As long as you know what they like and want, a book always makes a great gift. But why restrict yourself? You can get a little creative and find some great gift ideas that bookworms love. To help you out, here are some favorite non-book gifts for book lovers. As a bookworm myself, I love to settle in with a cup of tea, a pillow behind me and a throw on my lap. It is so cozy. A new mug would be a welcome gift and this cup has first lines of famous books printed on the side. There are other design options available as well. Looking for something to go with the mug? This package of black tea includes literary quotes. It pairs perfectly with the cup for your tea-loving bibliophile. Continuing to build on the cozy reading setup, a new throw is always useful. This throw is gorgeous whether used as a lap blanket while reading or taking a quick nap between chapters. Best of all, it is machine washable. Rounding out the cozy book nook is a throw pillow your friend will love. Looking for a literary gift that’s a bit different? Bards Dispense Profanity is a game for the cheeky. It is reminiscent of Cards Against Humanity and great for some laid back fun with friends. A pretty gold ink print which can be framed make a nice decorative touch whether in the office, living room, or bedroom. Make frequent trips to the library or the store? Get your book-loving friend this cute Kate Spade book tote to carry those books and groceries in style. Can’t sleep and want to read? This rechargeable book light will let you read in bed while letting your partner sleep in peace. We love ours and they get used all the time. This is, of course, a more expensive option. But, let me tell you, having a Kindle has been great. I can store hundreds of books on it (could do thousands) all in the space just a bit bigger than a smartphone. It is great for travel, reading in bed, or taking with me while waiting to pick-up the kids. Many libraries also offer ebooks for borrowing on the Kindle. How about a necklace? This silver book pendant is a beautiful and unique necklace your friend can wear. Make a statement with this bracelet for the book-lover on your list. Leather wraps with silver charms make this more casual bracelet great for casual wear. This nifty tool keeps books propped open so someone can be reading while cooking, knitting, studying, or doing any number of other things.